Whether they involved guns, cars, tires or electronic bingo machines, a string of announcements in the Nashville area last year all had one common denominator: jobs. 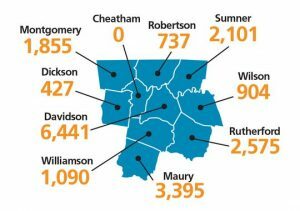 Company expansions and relocations last fiscal year were responsible for nearly 20,000 new jobs across the region, the highest total in more than a decade, according to the Nashville Area Chamber of Commerce. The growth was largest for existing companies looking to expand: About 70 percent of the new jobs came from companies already in Middle Tennessee. The relocations covered a number of industries, including music (Rounder Records), health care (Experian) and accounting (Dixon Hughes Goodman). One of the most high-profile relocations was Beretta, one of the world’s leading gun makers. Over the next several years, Beretta will move manufacturing and research and development operations to Gallatin, creating 300 jobs. The company had looked at more than 80 locations in seven states before deciding on Sumner County. The expansions included a host of familiar names in the region, including the General Motors plant in Spring Hill and Nashville-based Asurion. One of the most high-profile expansions of the year was UBS, the global banking giant.The company’s decision to add a shared services center in Nashville will help bring new life to a struggling office building downtown and add more than 1,000 workers in the city’s core over the next five years.